The 4th of July is associated with family reunions, picnics, carnivals, BBQ, and more, apart from being Independence Day. Why not indulge in some delicacies and call over friends and family to enjoy a hearty 4th of July meal on this federal holiday? Here are a few July 4 BBQ recipes that will answer all your big questions, including how to BBQ ribs in the oven or on the grill. Before you get ready to make barbecue ribs, you should dry off any excess moisture on the ribs with a paper towel. Peel off the membrane covering the bony side of the ribs. If you are falling short on time, here is a simple recipe that will teach you how to BBQ ribs quickly. 4 lbs pork ribs, 3⁄4 cup light brown sugar, 1 teaspoon hickory smoke salt, 1⁄2 teaspoon ground red pepper (optional), 2 cups of your favorite barbecue sauce, 1 tablespoon paprika, and 1 tablespoon garlic powder. Preheat oven to 300 degrees F. Mix spices and sugar to make a rub. Then, apply the rub on all the sides of the rib. With the shiny side out, place the ribs on two layers of foil. Cover the ribs with two more layers of foil and seal the edges of the foil. Place on the baking sheet and bake for two to 2 1/2 hours or until the meat from the ends of the bone starts to shrink. Remove the ribs from the oven. Cut them in serving-size portions of two to three pieces. Heat a broiler and arrange the ribs on the broiler with the bony side up. Brush on some sauce and broil for a minute or two until the sauce bubbles. Turn the ribs and repeat the process. You can also grill the ribs instead of broiling. 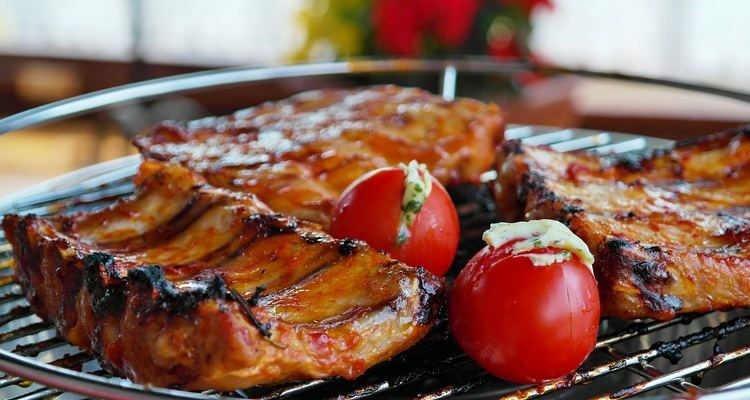 The main concern about grilling ribs is how long to cook the ribs on the grill to get juicy meat. You should cook the ribs for an hour on low heat. Try out this recipe to get lip-smacking BBQ ribs. 1 tablespoon ground cumin, 1 tablespoon chili powder, 1 tablespoon paprika, salt and pepper to taste, 3 pounds baby back pork ribs, and 1 cup barbecue sauce. Preheat a gas grill. You can also arrange charcoal briquettes on one side of the barbecue. Lightly oil the grate. Mix together paprika, salt, cumin, chili powder, and pepper. Apply the rub on all the sides of the rib. On a lower rack, place aluminum foil to capture the drippings. Place the ribs on the top rack of the grill. Reduce the heat and close the lid. Do not open it until one hour. Brush some barbecue sauce on the ribs, and grill for more five minutes. How long do you cook ribs on the grill if they’re wrapped in foil? Does wrapping the ribs in the foil reduce the cooking time? No, the ribs still need an hour to cook. To learn how to BBQ ribs in a foil, have a look through this recipe. 2 racks baby back ribs, each about 2 pounds; 2 teaspoons paprika; 2 teaspoons granulated garlic; 2 teaspoons dried thyme; 1 tablespoon kosher salt; ½ teaspoon freshly ground black pepper; and 1 cup prepared barbecue sauce. Heat the grill over medium heat. Soak the wood chips for 30 minutes. Mix the rub ingredients well. Cut each rack from the middle to create two smaller racks. Season the racks with the rub. Double wrap each rack using eight 18-by-24-inch sheets of heavy-duty aluminum foil. Place the ribs on the grill and cook over medium heat for an hour. Turn the packets to ensure even cooking. Remove the packets from the grill. Let the ribs rest in it for 10 minutes. Add the wood chips to the smoker box of a gas grill or to the charcoal and close the lid. When it starts smoking put the ribs in the grill with the bone side down. Grill over direct medium heat until they sizzle and are lightly charred. Remove from the grill and let them rest for a few minutes. Bethany, T., “Beth’s Melt in Your Mouth Barbecue Ribs (Oven),” Food web site, http://www.food.com/recipe/beths-melt-in-your-mouth-barbecue-ribs-oven-107786#activity-feed, last accessed July 03, 2017. Q., Bonnie., “Prize Winning Baby Back Ribs,” All Recipes web site; http://allrecipes.com/recipe/14539/prize-winning-baby-back-ribs/ , last accessed July 03, 2017.